In This “Hot, Hot, Hot” Edition- How-To drills, examples, news, opinions, a golf lesson in every issue. Inside this “Hotter Than a Tour Player After a Two Stroke Bunker Penalty” Edition- How-To drills, examples, news, opinions, a golf lesson in every issue. launch September 15th at 7:37am. Please do not forward this blog as I am only making 14 golf improvement memberships available. This special offer is also only available for 48 hours or until the first 14 are grabbed up, WHICHEVER COMES FIRST. And this notice is going out to 1,484 Subscribers. #1 Frankly, taking on 14 new golf improvement memberships all at once is a time consuming project. #2 More importantly, the prices for this offer are so low I simply can not afford to sell all of my available 2011 time at these numbers. My wife and accountant absolutely will not allow it. Reminder- The launch will be at 7:37am on September 15th. My college coach always had team try-outs the last week of October. Six grueling rounds in cold, rain, leaves, snow and wind. Why? Because he wanted dedicated golfers. And I want dedicated clients. By getting up early enough to call or e-mail in your 2011 golf improvement application, you are proving yourself to be a dedicated client. *There will be no exceptions on the limit of 14 golf improvement memberships for this launch offer. First come/first served. Here are the simple steps you need to take to make sure you are one of the first 14 to acquire a better golf game! #4 Set your alarm early for September 15th. Call 616.802.4969 or e-mail your application to info@grandrapidsgolflesson.com at 7:37am. #5 If you reach voicemail when calling leave a message and your application will be placed in order based on the time of your voicemail. Be patient. I will let you know ASAP if your application came in on time or not. P.S. A limited number of your 2011 sessions may be used this fall or over the winter at Champions Gate Indoor Golf Studio on 28th St. Break 90 by October 2nd…Guaranteed!! 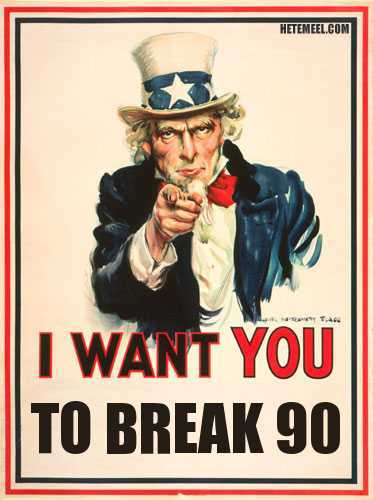 Are You Ready to Break 90?